Well, you've set up your hawk, followed the set-up directions to the tee and now it's time to FLY this big beautiful bird! Here are a few tips to hopefully make that first flight a success. If anyone would like to add to these suggestions, please email me! 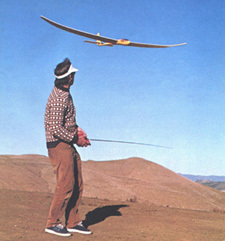 Rule #1: Do NOT launch your Hawk with a nose high attitude, whether hand launching, bungie launching or winch launching. 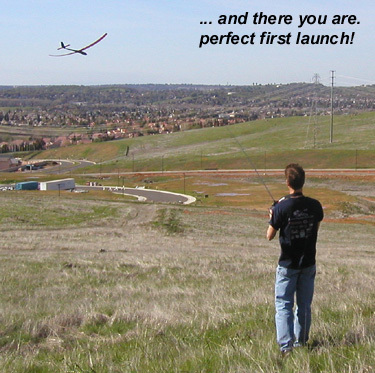 You MUST build some air speed and avoid a stall during the launch. Rule #2: Make sure you have the wings LEVEL at the time of release. Rule #3: Make sure your rudder is set up properly and DO NOT exceed the recommended amount of rudder travel or you will be prone to OVER CONTROL your ship. If you have not done so, go to the setup page. 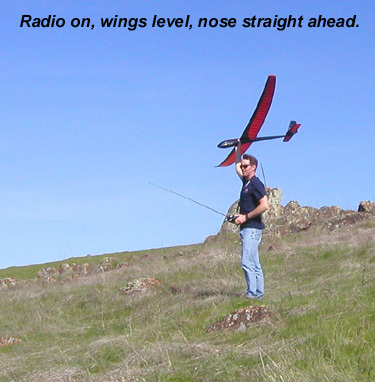 Remember that the Hobie Hawk has an unusual wing incidence angle (the angle of the wing reletive to the fuselage) and flys with a noticable nose down attitude. 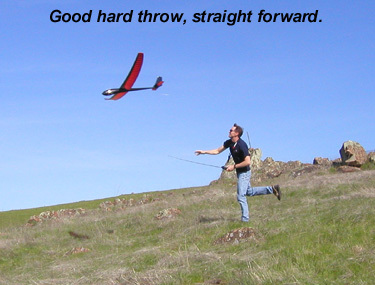 With your Hawk ready to fly pick it up and hold the wings with a 3-4 degree angle of attack (the wing angle relative to the wind) and look at how the Hobie Hawk will be flying - this is the famous nose down attitude of the Hawk. It is un-mistakable in flight. If you try to fly with a level fuselage, you will stall your Hawk! Here are a few photos of a good "hand launch" on a slope with a mild 10-12 mph of wind. More to be added... as I have the time!! !